On 21 June HVO reported that seismicity and deformation at Mauna Loa had been at near-background levels for at least the previous six months. The Aviation Color Code was lowered to Green and the Volcano Alert Level was lowered to Normal. During 2014 through most of 2017 seismicity was variable but elevated, and ground deformation was consistent with an influx of magma in the shallow reservoir. Mauna Loa has remained non-eruptive since April 1984. We previously reported on an April-October 2004, deep, long-period (LP) earthquake swarm and associated brief period of contraction (BGVN 29:09). After that and through 2010, deformation continued at variable rates and with brief pauses. During 2004-2010, HVO reported little variation in gas emissions at Mauna Loa. The material in this report is drawn from monitoring data collected by the USGS Hawaiian Volcano Observatory (HVO) and, in particular, Interferometric Synthetic Aperture Radar (InSAR) data provided by HVO's Mike Poland. A subsection below discusses the use of deformation data as a basis for modeling inferred magma bodies in the subsurface at Mauna Loa (Amelung and others, 2007). Slowed edifice inflation. Increased rates of inflation following the April-October 2004 deep LP earthquake swarm continued through 2007, when HVO reported that GPS and InSAR-based inflation rates had slowed substantially. Comparison of radar interferograms covering two intervals (11 October 2003-19 November 2005 and 24 March 2007-17 April 2010) highlights the slowed deformation rates during the latter interval (figure 24). To better understand the technique used to observe the slowed rate of deformation at Mauna Loa, see the next section. Figure 24. Radar interferograms of Mauna Loa covering the time intervals of (a) 11 October 2003-19 November 2005 and (b) 24 March 2007-17 April 2010. These interferograms highlight the slowing of inflation during the latter interval. The large number of color bands ('fringes') in (a) indicates an increased rate of inflation compared to the fewer number of fringes in (b). As depicted in the scale bar (bottom center), concentric and cyclical sets of fringes indicate a ground movement of 2.83 cm towards the satellite's line-of-sight during the time interval shown in each image. The images were produced from data acquired by the European Space Agency's Environmental Satellite (ENVISAT), with an incidence angle of 25° from the ground, looking W to E. Courtesy of Michael Poland, USGS-HVO. InSAR technique to monitor deformation. A technique has emerged that enables scientists to create an image of where and how much displacement occurred over a ground or glacial (ice) surface (e.g., Rosen and others, 2000). The technique's spatial coverage is variable from hundreds of square meters to hundreds of square kilometers. Measurements of the component of deformation along the instrument's line-of-sight typically have centimeter-scale precision. While the precision may be less than some other deformation techniques (i.e., GPS monitoring or tilt measurements), the broad coverage can pinpoint particularly interesting patterns and help define areas for collateral studies, including further modeling of the causes of deformation (see next section). The image, which is called a radar interferogram, compares two separate 'snapshots' acquired at distinct points in time. The snapshots are radar images of the topography of the ground surface in the area of interest (figure 25) acquired by an instrument mounted on an airplane or satellite. The images are generated by transmitting radar waves to the earth's surface; the radar waves then reflect (backscatter) and are measured upon their return to the instrument. To make one interferogram, two such images taken at different times are compared. Variations in the phase of the coherent radar signal in the two snapshots disclose areas where displacement occurred along the instrument's line-of-sight (example radar waves A-E, figure 25). In some cases scientists collect and process enough data to enable them to make a time series of interferograms, for example, annual interferograms that enable yearly comparisons of the ground surface over a decade of time. Figure 25. A cartoon representation of the basic principles of radar interferometry. As the satellite makes its first pass over a ground surface ('Initial ground surface'), it collects radar waves reflected off of the ground surface (solid wave, 'pass 1'). During a subsequent orbit (often months to years later), when the satellite again passes over the same ground surface, another collection is made from very nearly the same orbital location (dashed wave, 'pass 2'). If the ground surface deformed during the time between data collections (e.g., 'Subsided ground surface'), then the collected radar waves of the second pass will be out of phase compared to those collected during the first pass (example waves A-E, at right). The phase difference of the waves is then converted into the component of ground motion along the line-of-sight of the satellite (either towards or away from the satellite), and is represented by a color as part of a full color cycle. Since the technique is based on the phase difference of multiple waves, the accuracy is constrained by detectable fractions of the radar wave's wavelength. In figure 24, C-band radar (wavelength = 5.6 cm) was used. Image not drawn to scale. Image created by GVP staff. On the interferograms, interference patterns appear as full color cycles, or 'fringes', indicating how far out of phase the radar waves are when they return to the satellite (figure 25); one fringe indicates a line-of-sight ground offset equivalent to one half of the radar waves' wavelength. An increased number of fringes at a specific area within an image thus indicates increased deformation during the time between images, allowing estimation of deformation rates over the time period analyzed. Our discussion of this technique has omitted various assumptions, sources of error, and corrections used to process and interpret the data. Magma chamber and dike modeling. 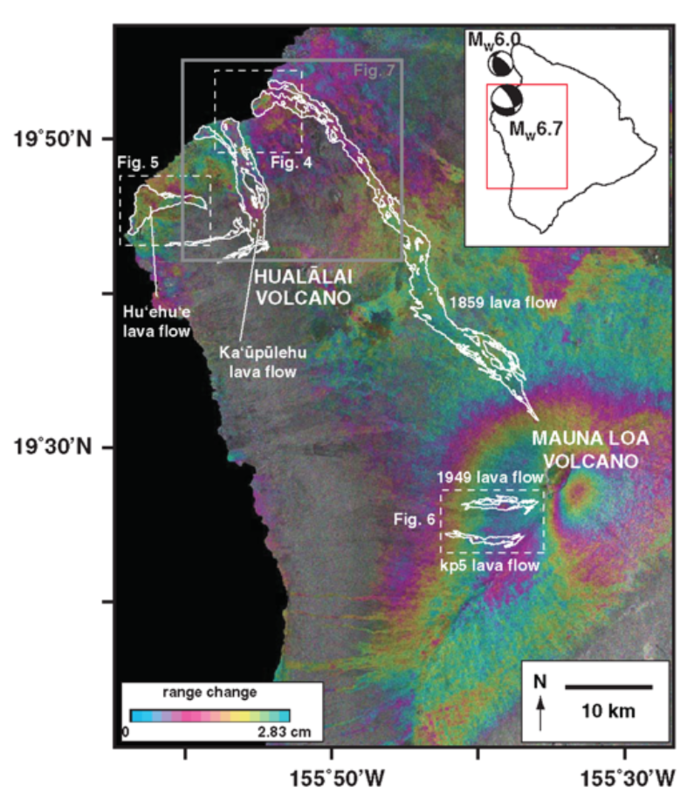 Amelung and others (2007) assessed measured ground deformation at Mauna Loa from InSAR data. They modeled the size, location, and geometry of inferred intrusive bodies beneath Mauna Loa that led to the observed surface deformation. Their modeling suggested a spherical magma chamber of 1.1 km radius, centered under the SE caldera margin at 4.7 km depth below the summit (0.5 km below sea level), and a vertical dike with most of its inflation occurring along an 8-km-long zone at depths of 4-8 km (Figure 26). The dike's direction of opening was normal to its inferred planar orientation. An HVO model, fit to ground-based GPS measurements, agrees with the model of Amelung and others (2007). Figure 26. (a) Vertical and (b) East components of ground-velocity measured at Mauna Loa during 2002-2005, determined from RADARSAT-1 InSAR data, and (c) the resultant model of the subsurface along a vertical cross-section oriented NE-SW. The satellite looked towards the E ('look direction') and had an incidence angle of ~45° from the ground. The white lines indicate the NE and SW rift zones (NERZ and SWRZ, respectively) that branch off of the caldera. The black line and circle in (a) and (b) indicate the map location of the modeled dike and magma chamber, respectively, also shown in cross-section view in (c). The location and span of Mauna Loa's summit caldera is indicated at the top of (c). The modeled spherical magma chamber and dike beneath the summit are shown in (c), indicating modeled opening rates of the dike (shown by the colored squares, with scale at bottom right). The dike opening rates are based on a uniform excess-magma pressure model of 1.8 Mpa/year, and are modeled to fit the measured ground-velocities shown in (a) and (b). Modified from Amelung and others (2007). References. Amelung, F., Yun, S.H., Walter, T.R., Segall, P., and Kim, S.W. (2007) Stress Control of Deep Rift Intrusion at Mauna Loa Volcano, Hawaii. Science, 316 (5827), pg. 1026-1030 (DOI: 10.1126/science.1140035). Rosen, P.A., Hensley, S., Joughin, I.R., Li, F.K., Madsen, S.N., Rodriguez, E., and Goldstein, R.M. (2000) Synthetic aperture radar interferometry, Proc. IEEE, 88, 333- 382. Information Contacts: Michael Poland, Hawaiian Volcano Observatory (HVO), U.S. Geological Survey, PO Box 51, Hawai'i National Park, HI 96718, USA (URL: https://volcanoes.usgs.gov/observatories/hvo/); Christelle Wauthier, Department of Terrestrial Magnetism, Carnegie Institute of Washington, Washington, DC. On 17 March HVO reported that seismicity at Mauna Loa remained above long-term background levels and was characterized by shallow earthquakes occurring beneath the Southwest Rift Zone (SRZ) at depths of less than 5 km. GPS data showed continuing deformation related to inflation of a magma reservoir beneath the summit and upper SRZ, with inflation recently detected in the SW part of the magma storage complex. The Aviation Color Code remained at Yellow and the Volcano Alert Level remained at Advisory. On 18 September HVO reported that for at least the previous year the seismic network at Mauna Loa detected elevated seismicity beneath the summit, upper Southwest Rift Zone, and W flank; the rate of these shallow earthquakes varied but overall had remained above the long-term average. The earthquakes locations were similar to those preceding recent eruptions in 1975 and 1984, although the magnitudes were comparatively low. In addition, ground deformation consistent with recharge of the volcano’s shallow magma storage system was also detected during the previous year. The rate and pattern of the deformation was similar to that measured during a period of inflation 2005, unrest that did not lead to an eruption. However, since the observations indicated that Mauna Loa is no longer at background levels, HVO raised the Aviation Color Code to Yellow and the Volcano Alert Level to Advisory. 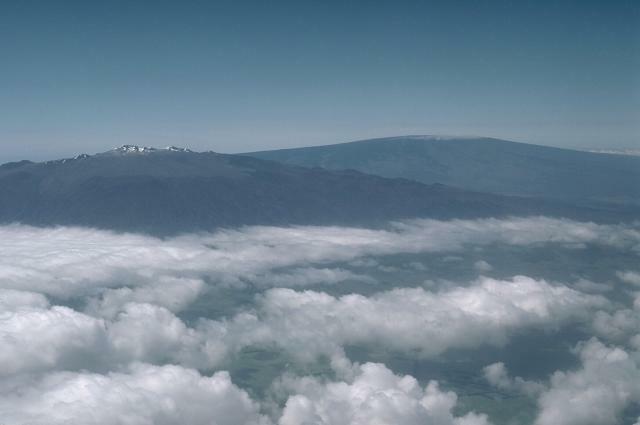 On 30 March, HVO reported that the Aviation Color Code and the Volcano Alert Level for Mauna Loa were both lowered to Green and Normal, respectively. Deformation had not been noted since mid-2009 and seismicity was at normal levels. HVO reported on 21 August that extension across Mauna Loa's summit had resumed over the previous few weeks after pausing for much of July. Seismicity remained at low levels at the volcano. According to HVO, since early July 2004 an increased number of earthquakes had been recorded from beneath Mauna Loa. From week to week, the numbers fluctuated but remained well above the norm. During the week ending 13 October, 110 earthquakes were located under the summit, up from 47 for the week ending 6 October. Through 13 October, more than 730 earthquakes related to the ongoing seismic activity have been centered beneath Mauna Loa's summit caldera and the adjacent part of the southwest rift zone. According to HVO, since early July 2004 an increased number of earthquakes had been recorded from beneath Mauna Loa. From week to week, the numbers fluctuated but remained well above the norm. Through September, more than 580 earthquakes were centered beneath Mauna Loa's summit caldera and the adjacent part of the southwest rift zone. Most of these earthquakes were quite deep, from 35 to 50 km below the ground surface and small, less than M 3. They were "long-period" (LP) earthquakes, which means that their signals gradually rise out of the background rather than appearing abruptly. Such a concentrated number of deep LP earthquakes from this part of Mauna Loa is unprecedented, at least in the modern earthquake record dating back to the 1960s. During about 4-11 October, however, only 23 earthquakes were located under the summit. No changes were noted by HVO at Mauna Loa through 27 September. Since early July 2004, an increasing number of earthquakes had been recorded from beneath Mauna Loa. From week to week the numbers fluctuated but remained well above the earlier established norm. Through the third week of September, more than 560 earthquakes were centered beneath Mauna Loa's summit caldera and the adjacent part of the southwest rift zone. Most of these earthquakes were quite deep, 35-50 km below the surface, and less than M 3. Inflation continued at the summit and showed no change during the increased seismic activity. No changes have been noted by HVO at Mauna Loa through 21 September. Since early July 2004, an increasing number of earthquakes has been recorded from beneath Mauna Loa. From week to week the numbers fluctuate but remain well above the earlier established norm. Through the second week of September, more than 500 earthquakes were centered beneath the summit caldera and the adjacent part of the southwest rift zone. Most of these earthquakes were quite deep, 35-50 km below the surface, and less than M 3. Inflation was continuing at the summit and has so far shown no change during the increased seismic activity. HVO reported on 18 May that inflation may have resumed at Mauna Loa's summit during the week, after slackening off following an increase in mid-February. Seismicity, however, remained low. Inflation was noted where the GPS network first showed definite lengthening of the lines across the summit caldera in late April or May 2002, after nearly 10 years of slight deflation. HVO interpreted the lengthening, uplift, and tilting to indicate resumed swelling of the magma reservoir within the volcano. HVO reported on 16 March 2003 that renewed inflation at Mauna Loa's Moku`aweoweo summit caldera began in late February 2003. The GPS network first showed inflation in late April or May 2002, which tailed off and perhaps stopped in mid-winter. The lengthening, uplift, and tilting were interpreted to indicate resumed swelling of the magma reservoir within Mauna Loa. Seismicity remained at low levels. HVO reported on 27 January that during the previous couple of months the rate of lengthening across Mauna Loa's summit caldera (Moku`aweoweo) slowed significantly. The lengthening started in late April or May, as did uplift measured by GPS and ground tilt measured by several dry-tilt stations. As of the 27th, seismicity remained at low levels. On the afternoon of 1 November volcanic tremor, centered low on Mauna Loa's SE flank, occurred for 30 minutes. HVO stated that this is a common occurrence, taking place several times a year in the same general region. The permanent, continuous GPS network indicated ongoing lengthening across Moku`aweoweo summit caldera, as it has since late April or May 2002. As of 28 October Mauna Loa continued to inflate, but seismicity remained at low levels. The permanent, continuous GPS network indicated ongoing lengthening across Moku`aweoweo summit caldera, as it has since late April or May 2002. A brief period of low-amplitude tremor occurred at Mauna Loa's summit on 7 October, lasting several minutes. It apparently was triggered by, or at least quickly followed, a small earthquake. The following day, several more small earthquakes took place. By the 10th, seismicity had returned to low levels. During 8-15 October, the permanent continuous global positioning system network indicated that ongoing lengthening occurred across Moku`aweoweo summit caldera as it has since late April or May. HVO reported on 30 September that a pattern of slow deflation occurring at Mauna Loa for the past 9 years abruptly changed in mid-May when the summit area began to slowly swell and stretch. Global Positioning System measurements revealed that distances across the summit caldera (Moku`aweoweo) have been lengthening at a rate of 5-6 cm per year, and the caldera has widened about 2 cm since 12 May. The summit area was slightly higher than before mid-May, consistent with swelling. In addition, the upper part of the SE flank showed outward movement. Seismicity remained low at Mauna Loa, although it may have been slightly higher level than during the pre-inflation interval. A small earthquake cluster event, with magnitudes between 1.1-1.7, occurred at Mauna Loa during 19-26 April. There were no signs indicating that an eruptive event was imminent and no significant deformation was recorded. Mauna Loa volcano began erupting at 2344 hours HST, 5 July 1975 (0944 GMT 6 July). By 0200 July 6th a line of fountains extended the length of the summit caldera in a N30°E direction through the cones of 1940 and 1949. Fresh lava covered most of the caldera floor, and overflowed from both South Pit and North Pit. Fountains extended for about 2 km beyond the caldera margin into the southwest rift zone, and new flows traveled as much as 3 km down the flanks of the volcano both southward and westward and partly filled the pit craters Lua Honhonu and Lua Hou. Fountains also extended into the northeast rift zone and ultimately reached 3 km beyond the margin of North Pit. Caldera activity stopped between 0400 and 0500, soutwest rift zone activity stopped about 0600, and activity concentrated in the northeast rift zone along two en echelon fissures 1 km long at an elevation of about 3,780 m. Major flows from these fountains traveled 5 km ENE along the rift zone and 6 km NNE down the N flank. Activity continued through the morning, declined in the afternoon, and all fountains ended by early evening. Frequent earthquakes centered along the northeast rift zone and harmonic tremor are continuing as of 0300 on 7 July. Information Contacts: Robert Tilling and Donald W. Peterson, Hawaiian Volcano Observatory, USGS. A substantial increase in the number of earthquakes beneath Mauna Loa was recorded 20-24 November (table 1). On the morning of 25 November, only one earthquake was recorded (beneath the NE rift). 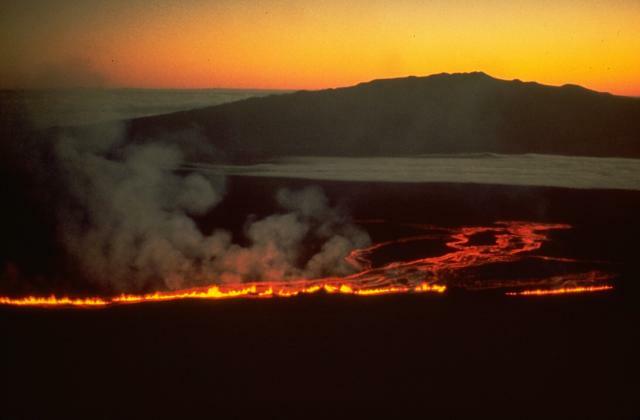 The USGS predicts a major eruption of Mauna Loa within the next 18 months. Table 1. Earthquakes recorded at Mauna Loa during 20-24 November 1976. The July 1975 eruption of Mauna Loa has been described by Lockwood and others (1976). 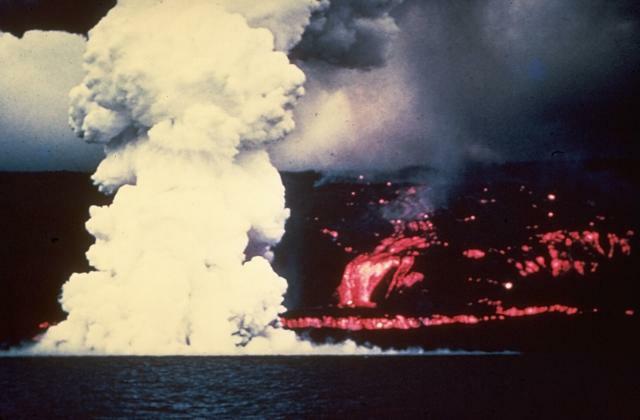 Soon after this eruption, Mauna Loa began to inflate, and, chiefly on the basis of the historic patterns of activity, the USGS predicted that a second eruption, followed soon thereafter by a larger eruption from the NE rift, was likely to occur before July 1978. During the first half of 1977, however, local seismicity and inflation rates declined considerably, and in July 1977 the USGS issued a press release withdrawing the "before July 1978" date for the predicted eruption. Seismicity beneath the summit region has remained low, but measurements made in December 1977 indicate that the inflation rate for June-December 1977 had increased to that recorded during 1976. Furthermore, dense fume clouds have been emitted from the 1975 eruptive fissures since October 1977. The USGS has installed gas monitoring devices on one of these fumaroles and is continuing to monitor the volcano closely. Reference. Lockwood, J., Koyanagi, R., Tilling, R., Holcomb, R., and Peterson, D., 1976, Mauna Loa threatening: Geotimes, v. 21, no. 6, p. 12-15. Information Contacts: G. Eaton, HVO, Hawaii. "Mauna Loa last erupted in July 1975. That eruption was preceded by an increase in both shallow and intermediate-depth earthquakes, and by extension of survey lines across the caldera (figure 1, left). Since 1980, and especially since early 1983, the number of shallow earthquakes beneath Mauna Loa has been increasing again. Intermediate-depth earthquakes have continued at a higher rate during the period from 1978 to present than during 1971-73, but have not shown the same pattern of increase as they did in 1974 (figure 1, right). Figure 1 also shows a recent increase in the rate of extension of survey lines across the summit caldera. Figure 1. Plot of cumulative number of local earthquakes at shallow (0-5 km) and intermediate (5-13 km) depths, and extension (in mm) on two survey lines across the summit caldera, for 1970-75 (left), and 1978-83 (right). "The recent rate of strain from apparent intrusion of magma beneath the summit region shows an increasing trend from both seismic and ground surface deformation data. The present strength of the summit region is not known, so no precise forecast of the next eruption can be made. However, the present seismic and deformation data indicate a significantly increased probability of eruption of Mauna Loa during 1983 or 1984." Information Contacts: R. Decker, R. Koyanagi, and J. Dvorak, HVO, Hawaii. The following (except for the plume data) is from HVO. Times noted below are preliminary and subject to slight revision after later analysis. "A long-expected flank eruption of Mauna Loa began on 25 March, and had ended by 14 April. Premonitory activity. "The 25 March outbreak gave almost no short-term instrumental warning. Seismic activity had been increasing gradually through March (figure 2), but was relatively low immediately preceding the outbreak; only 29 microearthquakes were recorded beneath the summit caldera during the preceding 24 hours (in contrast to 700 microearthquakes/day in September 1983). Figure 2. Number of earthquakes per day at Mauna Loa, 1 January-5 April. The start of the eruption is indicated by an arrow. "Several people saw probable fume clouds from the summit caldera and a camper at the summit noted small explosions from the 1975 eruptive fissures on 23 March. One hiker had reported seeing 'glowing cracks' near the 1940 cone on 18 March, but no anomalous activity was detected on a thermal probe in the 1975 fumaroles. Oxidation state and temperatures of fumarolic gases remained essentially unchanged prior to the last satellite transmission about midnight on 24 March. Eruption narrative. "At 2255 on 24 March, a small earthquake swarm began directly beneath the summit. Weak harmonic tremor with an amplitude of about 1 mm was recorded at the summit station (WIL, figure 3) at 2330. The number of small summit earthquakes increased at 2350. Tremor amplitude recorded at the summit increased to about 5 mm at 0015 on 25 March, remained high at 0051, and was recorded on all Mauna Loa and Kilauea summit area stations. Figure 3. Sketch maps of the NE rift zone and summit of Mauna Loa, showing positions of 1984 lava flows (stippled) as of 5 April. Eruption fissures are indicated by hachured lines. The edge of the suburbs of Hilo is shown by a dotted line on the NE rift zone map. The areas covered are shown by the index map (inset). "At 0055 a magnitude 4.0 earthquake beneath the summit awoke geologists (from the University of Massachusetts) camped at Pu'u Ula'ula on the NE Rift Zone. At 0056, the telescope at the summit of Mauna Kea (42 km NNW of Mauna Loa) began high-amplitude oscillation, preventing astronomical observations for the next few hours. Between 0051 and 0210, 11 earthquakes with magnitudes between 2.0 and 4.1 were recorded beneath the summit. At 0100 borehole tiltmeters recorded the onset of rapid summit inflation. "A military satellite detected a strong infrared signal from the summit at 0125. Glow was sighted in the SW portion (1940 cone area) of the summit caldera by an observer on the summit of Mauna Kea at 0129, by the geologists at Pu'u Ula'ula at 0130, and from Kilauea at 0140. At 0146, fountain reflection on fume clouds observed from HVO suggested that fountaining extended across much of SW Mokuaweoweo and was migrating down the SW Rift Zone. "At 0232 the tops of fountains within Mokuaweoweo were seen from Pu`u Ula`ula, suggesting a height greater than 100 m. At approximately 0340, fountaining ceased on the SW Rift Zone. At 0357, 30-m-high fountains migrated out of Mokuaweoweo, down the upper NE Rift Zone. Lava flowed downrift and onto the SE flank. "At approximately 0600, fountaining in the caldera gradually ended. At 0632, a new vent opened about 700 m E of Pohaku Hanalei and 8 minutes later another en echelon fissure began to erupt about 600 m downrift. Lava appearance was preceded by 3 minutes of copious white steam emission from the fissure. For the next 2.5 hours, activity waned. "At 0905, profuse steaming appeared on a fracture at about 3,510 m altitude, and at 0910 fountaining 15-40 m high began at 3,410 m and migrated downrift. At 0930, fountains above Pohaku Hanalei died down as lava production increased to approximately 1-2 x 106 m3/hour along a 2 km-long curtain of fire between about 3,400 and 3,470 m. The loci of most vigorous fountaining alternated along the 2-km fountain length. Much of the production from these vents was consumed by an open fissure parallel to and S of the principal fissure upslope, although an aa flow did move 5 km SE, S of an 1880 flow. During activity of these vents, episodic turbulent emissions of red and brown `dust' from the eruptive fissures sent clouds to about 500 m height. At 1030, steaming was noted along a 1-km-long crack system extending from about 3,260-3,170 m, but there was no further downrift migration of eruptive vents for several hours. At about 1550, ground cracking extended below 3,000 m, and at 1641 eruptive vents opened at about 2,800 m and migrated both up- and downrift. At 1830 an eruptive vent extended about 1.7 km from about 2,770-2,930 m elevation. Fountains to 50 m height fed fast-moving flows to the E and NE. Activity waned at the 3,400-m vents. "By 0640 the next day, all lava production had ceased above 3000 m. Fountains (to 30 m height) were localized along a 500-m segment of the fissure that had opened the previous afternoon. The fastest moving flow cut the power line to the NOAA Mauna Loa Observatory shortly before dawn. At 0845, the E flows were spread out over a wide area above 1,900 m elevation, but their advance slowed during the day. Four principal eruptive vents then developed along this fissure system. Two vents fed the NE flow (1), while the other two fed the S (2-4) flows. Flow 1 steadily advanced downslope 27-28 March (figure 4), between the 1852 and 1942 lava flows. Approximately 80% of the lava production fed flow 1. Flows 2-4 ceased significant advance by 28 March. The terminus of flow 1 stopped significant advance by early 29 March, while production at the vents remained essentially constant. This suggested that a new branch flow had developed upslope. Bad weather prevented confirmation of the new branch until 30 March. This new flow (1A) moved rapidly downslope, N of flow 1. Figure 4. Rates of movement of flows 1, 1A, and 1B in kilometers per day. Small circles represnet observations of flow positions. Courtesy of J.P. Lockwood. "Phase 17 of Kilauea's E Rift Zone eruption began that morning but had no apparent effect on Mauna Loa activity. Likewise Kilauea tilt showed no deflection at the time of the Mauna Loa outbreak on 25 March. "Flow 1A slowed on 31 March as the feeding channel became sluggish, and the flow thickened and widened upstream. At 1215 on 5 April, the flow was moving very slowly (18 m/hour) slightly below 900 m elevation. A major overflow at about 2,000 m shut off most of its lava supply and created a fast-moving flow (lB), which advanced 3 km NE to about 1,800 m elevation by 1700. Deformation. "Much of the NE rift zone geodetic monitoring network was measured shortly before the 25 March outbreak, and EDM, tilt, and gravity stations were re-measured several times during the eruption. Although continuously recording tiltmeters at the summit showed sharp inflation (dike emplacement) immediately preceding the outbreak, major subsidence of the summit region accompanied eruptive activity along the NE rift. The center of subsidence, near the S edge of the summit caldera (figure 5), was coincident with the center of uplift identified from repeated geodetic surveys between 1977 and 1983. The amount of summit deflation recorded by tilt and horizontal distance measurements exceeded the amount of gradual inflation of the volcano since the July 1975 summit eruption, suggesting substantial injection of magma into the summit area prior to this eruption, and possibly prior to the first EDM line across the summit caldera in 1964. Maximum vertical elevation change, inferred from repeated gravity measurements, is 500 mm. Figure 5. Tilt changes near the summit of Mauna Loa, July 1983-30 March 1984. "Large extensions occurred across the middle NE rift zone during dike emplacement on 25 March, but EDM monitor lines across this zone showed no significant change after the initial dilation. The rate of summit subsidence initially followed an exponential decay, similar to subsidence episodes in the summit region of Kilauea. Since 30 March, tilt and horizontal distance measurements have indicated a steady rate of deflation (figures 6 and 7), although measurements on 6 April suggest decreasing deflation rates. Figure 6. Plot of summit tilt vs. time, 25 March-3 April 1984. Figure 7. Change in horizontal distance across the summit of Mauna Loa vs. time, 25 March-3 April 1984. Dike propagation. "All dikes were emplaced within the first 15 hours of the eruption. The eruptive fissure (surface expression of dikes) extended discontinuously along a 25-km zone from 3,890 m on the SW rift zone to about 2,770 m on the NE rift zone. Ground cracking along most of this zone demonstrates the continuity of the dike at shallow levels. Lateral propagation rates vary from >2,500 m/hour down the SW rift zone to about 1,200 m/hour in lower parts of the NE rift zone (figure 8). Figure 8. Rate of propagation of eruption fissures, shown as distance from the 1940 cone (in the SW part of the summit caldera) vs. hours after the start of the eruption. Geoelectric studies. "One self-potential (SP) profile, first measured in July 1983, exists across the NE Rift Zone about 1 km W of the main erupting vents. The first complete reoccupation of the SP line 3 days after the eruption's start showed an amplitude increase slightly > l00 mV centered over a zone about 300 m wide across the 1.5 km-long crack zone N of Pu'u Ula'ula. VLF measurements show that the dike is located nearly in the center of the cracked zone, directly beneath the pre-existing SP maximum, at a very approximate depth of 150 m.
Areal extent and volume of lava. "As of 5 April, 25-30 km2 of area was covered. The lava is mostly pahoehoe near the vents, but is mostly aa more than 2 km from the vents. The volume was estimated to be about 150 x 106 m3 by 5 April." Eruption plume. The eruption produced a large gas plume that was carried thousands of kilometers to the W. The plume from the summit caldera activity was clearly visible from HVO. An airline pilot approaching Honolulu at dawn 25 March reported that the top of the plume was between 10.7 and 11 km altitude and was drifting SW. Observers at Honolulu airport tower (300 km NW of Mauna Loa) reported that the top of a tall cumulus-like cloud became visible S of the airport just before dawn. There was no evidence that the plume reached the stratosphere; the tropopause on 25 March was at about 18 km altitude. The plume was carried W by trade winds. By 30 March, a haze layer was detected at Wake and Johnston Islands (3,900 km W and 1,400 km WSW of Mauna Loa; table 2). Haze reached Kwajalein (4,000 km WSW of Mauna Loa) the next day and had reached Guam (6,300 km WSW of Mauna Loa) by 2 April. Table 2. Visibilities at airports on several islands affected by the plume from Mauna Loa (distances are from Mauna Loa). All times are Hawaiian Standard Time. Note that all except Johnston Island are across the International Date Line from Hawaii. Data courtesy of NOAA. SO2 emitted by Mauna Loa was detected by the TOMS instrument on the Nimbus 7 polar orbiting satellite, which passed over Hawaii daily at about local noon (figure 9). Although the TOMS instrument was designed to measure ozone, it is also sensitive to SO2. An algorithm has been developed to isolate SO2 values and calculate its approximate concentration within pixels (picture elements) roughly 50 km in diameter. Preliminary estimates of the total SO2 in the Mauna Loa plume, using TOMS data, were roughly 130,000 metric tons on 26 March and 190,000 metric tons on 27 March. Figure 9. Preliminary SO2 data from the TOMS instrument on the Nimbus-7 satellite. All values less than 10 milliatmosphere-cm (100 ppm-meters) have been supressed. Each number or letter represents the average SO2 value within an area 50 km across. 1 = 11-15 matm-cm = 101-150 ppm-m, 2 = 16-20 matm-cm = 151-200s ppm-m, etc; 9 is followed by A, B, C, etc. Courtesy of Arlin Krueger. References. Decker, R.W., Koyanagi, R.Y., Dvorak, J.J., Lockwood, J.P. Okamura, A.T. Yamashita, K.M., and Tanigawa, W.R., 1983, Seismicity and surface deformation of Mauna Loa volcano, Hawaii: EOS, v. 64, no. 37, p. 545-547. Koyanagi, R.Y., Endo, E.T., and Ebisu, J.S., 1975, Reawakening of Mauna Loa volcano, Hawaii; a preliminary evaluation of seismic evidence: Geophys. Res. Letters, v. 2, no. 9, p. 405-408. Information Contacts: J. Lockwood and HVO staff, Hawaii; M. Rhodes, Univ. of Massachusetts; M. Garcia, Univ. of Hawaii; T. Casadevall, CVO, Vancouver, WA; A. Krueger, NASA/GSFC; M. Matson, NOAA/NESDIS. "The NE Rift Zone eruption, which began on 25 March, ended early on the morning of 15 April. Lava output and fountain vigor steadily decreased during the last week of the eruption. As flow channels became blocked (by sluggish aa and channel collapse breccias) progressively farther upslope, flows terminated higher on Mauna Loa's NE flank. Many short overflows of viscous aa, up to 15 m thick, moved less than a few hundred meters from these points of channel blockage. By 10 April, no lava flowed below 2,400 m. The total area covered by new lavas increased very little after 5 April, as multiple flows mostly piled on top of older flows. Total volume for this eruption was estimated at 180-250 x 106 m3." Information Contacts: J. Lockwood and T. Wright, HVO, Hawaii. "Mauna Loa's latest eruption was in March-April 1984 on the Northeast rift zone. The eruption was associated with a large collapse (figure 10) and seismicity that peaked during and following the eruption (figure 11). Since 1984 the volcano has begun to reinflate, as shown by outward tilt and horizontal extension of Mauna Loa's summit area. Figure 10. EDM data along three lines across Mauna Loa's summit caldera, January 1983-4 November 1987. HVO 93 is on the NW rim of the caldera, and the three lines cross the caldera in ESE, SE, and S directions, respectively, to the SE rim. Courtesy of HVO. Figure 11. Daily number of recorded short-period (top) and long-period (middle) summit microearthquakes, and NE rift events (bottom) at Mauna Loa, January 1984-4 November 1987. Courtesy of HVO. Seismicity. "Following the increase and peak in seismicity of the last eruption in Mar-Apr 1984, the number of shallow microearthquakes had slowly decreased (figure 11). Most of the post-eruption events were attributed to the gradual structural adjustments from the major deflation at the summit (resulting from the voluminous magma withdrawal) and the principal eruptive vent near Pu'u Ulaula on the Northeast rift zone. The post-eruption pattern of decreasing seismicity is indicated by the daily number of summit microearthquakes and Northeast rift events. "There has been no significant seismic activity beneath the summit and rift zones of Mauna Loa since the 1984 eruption, and the present level of shallow seismicity is relatively low. There has been some increase in intermediate-depth events beneath the volcano noticed over the past year. Most of the events are very small, recorded only on a few summit and rift stations, and essentially < 0.5 in magnitude. Ground deformation. "Deformation studies show that Mauna Loa reinflation has been steady; at this writing the summit has recovered over 1/3 of the amount of subsidence that took place during the eruption, as measured by both dry tilt and cross-caldera EDM (figure 10). "A forecast of the next Mauna Loa eruption will depend on two things: an increase in shallow earthquakes and tilt recovery. The last two eruptions showed a precursory period of 1 year (July 1975 eruption) and 4 years (March 1984 eruption) respectively from the time of increased seismicity to the onset of eruption. There is no absolute level of tilt recovery at which we can specify that Mauna Loa will erupt. However, we would consider roughly 90% recovery from the 1984 deflation would indicate a state of readiness to erupt. On the basis of the data shown here we would not expect a Mauna Loa eruption for at least five years. We will update this estimate as we continue to monitor tilt and seismicity . . . ."
Information Contacts: T. Wright, R. Koyanagi, and A. Okamura, HVO. By 17 November 1988, when Mauna Loa's summit tilt network was relevelled, the summit region had recovered ~50% of the deflation associated with the 1984 eruption (figures 12 and 13). Intermediate-depth microearthquakes have occurred at a moderate rate in the summit region. However, the abundant shallow seismicity that originated beneath the summit crater during the year before the 1975 eruption and for 4 years before the 1984 eruption has not been observed. The absence of such precursory shallow seismicity suggests to HVO geophysicists that the next eruption . . . is several years away. Figure 12. Changes in N-S and E-W components of tilt at Mauna Loa, measured by station NEW MOK 2 on the NW rim of the caldera, 1 June 1983-17 November 1988. Figure 13. 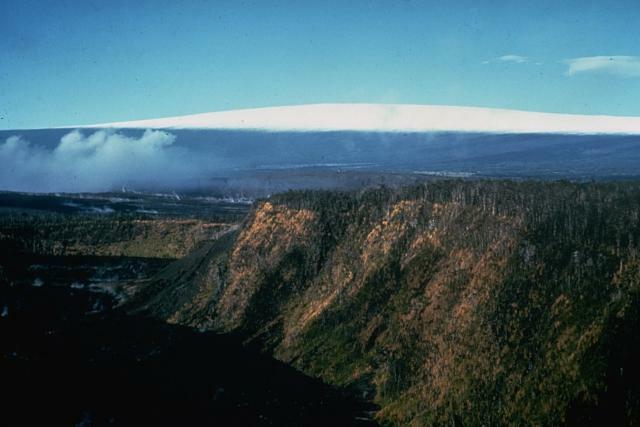 Dry tilt changes near the summit of Mauna Loa from 23-27 April 1984 to 8-17 November 1988. Courtesy of T. Wright. Information Contacts: T. Wright, HVO. Surface deformation measurements indicate gradual reinflation of Mauna Loa's summit since its 1984 eruption. Earthquake counts have fluctuated, but have apparently increased since late 1990. Two bursts of intermediate-depth volcanic tremor, beginning at about 1200 on 13 July, preceded a swarm of long-period earthquakes that continued for ~14 hours. Activity peaked between 2300 on 13 July and 0100 the next morning. As the long-period events gradually declined, shallow microearthquake activity increased, and continued for about 6 hours. All of the events were too small for precise location. The 13 July activity began ~2 hours before an earthquake swarm under the summit of Kilauea. Seismicity at Mauna Loa has apparently returned to average background levels since mid-July. Information Contacts: P. Okubo, HVO. Mauna Loa is the southern-most volcano on the island of Hawaii. Following the last eruption of Mauna Loa, during March-April 1984 (SEAN 09:03), there have been several periods of inflation and deflation at the volcano's summit caldera, Moku`aweoweo. As of September 2002, Mauna Loa has remained non-eruptive (figure 14) for 18.5 years. The pattern of deformation at Moku`aweoweo abruptly changed in mid-May 2002 from deflation to inflation, lasting until at least September 2002. An archive of deformation and seismic data from Mauna Loa dating back to the 1970s provides an example of the volcano's pre-eruptive and precursory behavior. Figure 14. Oblique shaded-relief map (N at top) showing the location of the city of Hilo and the five volcanoes that built the island of Hawaii. The young growing submarine volcano Loihi is not shown. When including the submarine portions of Hawaii attributed to Mauna Loa, it ranks as Earth's largest active volcano, encompassing 51 percent of the island's surface area and comprising a volume over ~ 65,000 km3. Courtesy HVO. After the last Bulletin report about Mauna Loa in July 1991(BGVN 16:07) the volcano's summit continued to gradually inflate as it had since the 1984 eruption. This trend reversed in 1993-1994 when distances across the caldera shortened by as much as 7 cm, and leveling surveys in 1996 and 2000 measured more than 7 cm of subsidence SE of the caldera. Beginning on 24 April 2002 at 0645 a notable cluster of deep earthquakes (darkest circles in figure 15) occurred in a 52-hour period. The earthquakes ended on 26 April at 1045. Many of the epicenters plotted within or close to the caldera's SW margin. The earthquakes ranged in depth from 26 to 43 km and in magnitude from 1.1 to 1.7. Several shallow earthquakes preceded this cluster; the largest, a magnitude 2.5 event on 21 April at 1931, was located ~3 km beneath the SW rift zone. After the cluster, several deep long-period events were recorded beneath the SW rift zone. At that time data from the continuous tiltmeter, dilatometer, and nearly continuous global positioning system (GPS) stations failed to suggest significant deformation of Moku`aweoweo caldera, upper-rift zones, or outer flanks. Figure 15. Plot showing the magnitudes, locations, and depths of earthquakes registered at Mauna Loa during 7 April- 26 September 2002. Following the swarm of deep earthquakes during 24-26 April (dark circles), seismicity was somewhat elevated. Inflation. HVO maintains several continuously recording GPS stations installed in 1999 (figure 16). Beginning in late April or early May 2002, deformation data began to show signs of renewed activity. Figure 16. Map showing the several GPS stations HVO maintains on Mauna Loa as of September 2002. HVO plans to install several additional stations (white dots), on indefinite loan from Stanford University. Courtesy HVO. Figure 17 shows the change in distance between MOKP and MLSP GPS stations, located on opposite sides of Moku`aweoweo. The increased distance between the two stations was interpreted to represent inflation of the summit magma reservoir, centered ~5 km below the caldera. The small amount of extension marks a noticeable change from the pattern of deflation during the preceding 9 years. GPS measurements also revealed that the summit area had inflated about 2 cm, consistent with swelling. Figure 17. Graph showing the change in distance between GPS stations MOKP and MLSP, located on opposite sides of Moku'aweoweo caldera, as seen during 4 October 2000-30 September 2002. Distance across Moku'aweoweo began to increase by 5-6 cm/year starting in late April-May 2002. Courtesy HVO. The switch from slow deflation to more rapid inflation occurred around 12 May. GPS data indicated lengthening at a rate of 5-6 cm per year. Therefore, as of 26 September the caldera had widened about 2 cm since 12 May. Measurements at GPS stations farther out on the flanks showed that swelling occurred at more than the summit, in particular, the upper part of the SE flank was moving outward. In order to test the precision of the GPS measurements, HVO compared the GPS data against dry-tilt method data at the summit, an independent means to measure ground deformation using land-surveying instruments, deployed at regularly visited stations. These confirmed the GPS results, though with less precision. Electronic-tiltmeter data obtained at the Moku'aweoweo tiltmeter were also analyzed for changes in tilt direction. No significant volcanic tilt was recorded that deviated from the diurnal signal corresponding to daily temperature fluctuations, or an annual signal corresponding to seasonal temperature changes. During the inflationary period, seismicity at Mauna Loa was at a somewhat elevated level following the 24-26 April earthquake cluster. But, it remained far lower than it was the months prior to the 1975 and 1984 eruptions. May-September 2002 unrest in comparison to activity since 1974. For Mauna Loa these data sets are available: electric distance meter (EDM) measurements since about 1975, GPS observations since 1999, dry-tilt observations since 1975, and seismicity since 1974. The capability to detect unrest at Mauna Loa has increased in the past few years with the installation of many new, continuously recording electronic tiltmeters, GPS receivers, and strainmeters (figure 18). Figure 18. Map showing locations of continuously recording instruments for measuring deformation and seismicity at Mauna Loa as of September 2002. This map omits many additional benchmarks used in various deformation surveys. Courtesy HVO. Figure 19 shows the distance measured across Moku`aweoweo caldera between MOKP and MSLP benchmarks by EDM during 1975 to September 2002, and by GPS beginning in 1999. Abrupt extensions associated with the 1975 and 1984 eruptions were caused by the rise of magma from the summit reservoir to the surface. During the 1984 eruption, the summit area subsided rapidly as lava erupted. When the eruption stopped, the summit reservoir again began to inflate in response to the influx of magma, as indicated by the increasing distance between the two benchmarks until about1993. Inflation did not occur again until early May 2002 when the slow contraction across the summit changed abruptly to extension. This extension rate is the highest since immediately after the 1984 eruption. Figure 19. The change in distances across Moku`aweoweo caldera at Mauna Loa, between MOKP and MSLP benchmarks (see map inset) as measured by electronic distance meter since about 1975 to September 2002 and by GPS receivers since 1999. Note the abrupt change from contraction to extension in May 2002. Courtesy HVO. GPS measurements have only been made at Mauna Loa since 1999, but in that relatively short time an abrupt change in ground movement has been recorded (figure 20). Measurements made during January 1999-May 2002 show small velocities of ground displacement towards the SW. In contrast, during May-September 2002 the direction of ground motion changed from a fairly uniform, southeastward movement to a predominately radial pattern. In addition, the rate of ground motion increased by 5 to 10 times. Figure 20. Velocities of ground displacement measured by GPS stations on Mauna Loa during 1999 to 12 May 2002 (light lines) and 12 May to 21 September 2002 (black lines). The arrows represent the speed and direction of motion. The tips of the arrows representing the actual motion point lie somewhere within the uncertainty ellipses. Courtesy HVO. Ground tilt away from the caldera occurs when magma accumulates beneath the surface. Although electronic measurements provide much more precise readings, the dry-tilt method remains in use at HVO after 35 years for several reasons. First, the measurements can be made nearly anywhere at any time. Second, they are not subject to long-term instrument drift. Lastly, they provide an independent corroboration of measurements made by more sophisticated modern instruments. Dry-tilt measurements revealed the following: inflation between the 1975 and 1984 eruptions (figure 21a), inflation after the 1984 eruption, continuing until 1993 (figure 21b), and deflation from 1993 through March (probably May) 2002 (figure 21c). After March (probably May), the tilt returned to an inflationary pattern (figure 21d). The most recent pattern of inflation is based on only two sets of measurements, and the tilt varies, with some smaller arrows pointing inward, so it is much less certain than the past patterns. Still, the radial pattern strongly suggests that inflation is occurring. Figure 21. Rates of ground tilt measured in the summit region of Mauna Loa during 1975 to September 2002. Arrows point in the direction of downward tilt rate of the ground surface; arrow lengths show the amount of tilt in microradians (note scale bars). A) inflation during 1975-1984, between the last two eruptions at Mauna Loa; b) inflation after the 1984 eruption to 1993; c) deflation during 1993 to March (probably May) 2002; and d) a general return to inflation until at least September 2002. Courtesy HVO. HVO's telemetered seismographic network recorded significant changes in seismicity before the Mauna Loa eruptions in 1975 and 1984 (figure 22). The short-term forecasts of these eruptions were based in large part on precursory activity. Both eruptions were preceded by an increase in earthquakes at intermediate depths NE of Moku`aweoweo, and then by an increase in shallower earthquakes beneath Mauna Loa's summit. From the 1984 eruption until late April 2002, approximately 30 earthquakes were located per year beneath Mauna Loa's summit and upper flanks. Rates of seismicity moderately increased beginning in late April 2002, particularly at depths greater than 15 km (figure 22d). As of 29 September 2002, 100 earthquakes were recorded in 2002 below the summit and upper flanks of the volcano, 83 of which occurred after mid-April. This rate is markedly higher than those of previous years, but it is still well below the rates seen prior to the last two eruptions. Before an eruption becomes imminent, HVO scientists expect that rates of shallow seismicity will elevate to levels much higher than those observed in late September 2002. Figure 22. Monthly earthquakes (bars, scales at left) and cumulative numbers of located earthquakes (curves, scales at right), separated into three depth ranges, within or beneath Mauna Loa between 1974 and 29 September 2002. The earthquakes shown occurred beneath Mauna Loa's summit and upper flanks and had magnitudes greater than 1.0. Part "a" shows all earthquakes; "b", shallow earthquakes (0 to 5 km deep); "c", intermediate earthquakes (5 to 15 km deep); and "d", deep earthquakes (greater than 15 km deep). Courtesy HVO. References. Moore J G, Clague D A, Holcomb R T, Lipman P W, Normark W R, Torresan M E, 1989. Prodigous submarine landslides on the Hawaiian Ridge. J Geophys Res, 94: 17,465-17,484; Lockwood J P, Lipman P W, 1987. Holocene eruptive history of Mauna Loa volcano. U S Geol Surv Prof Pap, 1350: 509-535. Information Contacts: Hawaiian Volcano Observatory (HVO), U.S. Geological Survey, PO Box 51, Hawaii National Park, HI 96718, USA (URL: https://volcanoes.usgs.gov/observatories/hvo/). After a swarm of deep earthquakes centered just S of Mauna Loa's summit caldera in late April 2002, seismicity remained barely elevated until July 2004. In other words, seismicity during late April 2002-July 2004 stood far lower than it did in the months prior to the 1975 and 1984 eruptions. Starting in July 2004, a swarm of small (M < 3), deep (> 40 km), mostly long-period (LP) earthquakes occurred just S of the caldera and adjacent areas. Neither the depth nor the magnitude of the earthquakes changed significantly. Through 13 October 2004 more than 730 related earthquakes occurred beneath the summit caldera and the adjacent part of the SW rift zone. The location and magnitude of earthquakes making up the recent swarm (seismicity from 24 April-15 October 2004, a 6-month interval) are shown in figure 23. Such a concentration of deep LP earthquakes from this part of Mauna Loa was unprecedented in the modern earthquake record dating back to the 1960s. In contrast, more typical seismicity over a 6-month period at Mauna Loa is shown in a figure in a previous issue (BGVN 27:09). By comparison to the interval 24 April-15 October 2004, earthquakes in a typical 6 month interval are relatively sparse. Figure 23. Seismicity for Mauna Loa for the 6-month period 24 April-15 October 2004. Courtesy of the U.S. Geological Survey, Hawaiian Volcano Observatory. Inflation continued at the summit through the start of the earthquake swarm. In late August 2004, however, distances across the summit caldera began to contract significantly, apparently caused by the center of inflation shifting slightly to the S, rather than by deflation. This was the first contraction since inflation started in late April or early May 2002. Toward the end of September, the contraction ended and the line once again began to lengthen. During 2004, the inflation had been at a fairly steady to slightly increasing rate until the contraction in late August. When present, the lengthening, uplift, and tilting were taken to indicate swelling of the magma reservoir within the volcano. Massive Mauna Loa shield volcano rises almost 9 km above the sea floor to form the world's largest active volcano. Flank eruptions are predominately from the lengthy NE and SW rift zones, and the summit is cut by the Mokuaweoweo caldera, which sits within an older and larger 6 x 8 km caldera. 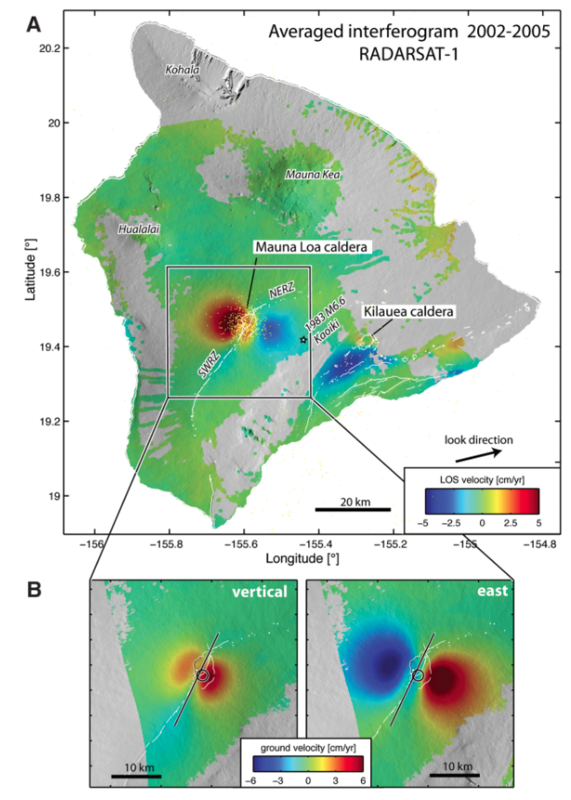 Two of the youngest large debris avalanches documented in Hawaii traveled nearly 100 km from Mauna Loa; the second of the Alika avalanches was emplaced about 105,000 years ago (Moore et al. 1989). Almost 90% of the surface of the basaltic shield volcano is covered by lavas less than 4000 years old (Lockwood and Lipman, 1987). During a 750-year eruptive period beginning about 1500 years ago, a series of voluminous overflows from a summit lava lake covered about one fourth of the volcano's surface. The ensuing 750-year period, from shortly after the formation of Mokuaweoweo caldera until the present, saw an additional quarter of the volcano covered with lava flows predominately from summit and NW rift zone vents. This volcano is located within the Hawaiian Islands, a UNESCO World Heritage property. Brigham W T, 1909. The volcanoes of Kilauea and Mauna Loa. Mem B P Bishop Museum, 2: 1-222. Garcia M O, Davis M G, 2001. Submarine growth and internal structure of ocean island volcanoes based on submarine observations of Mauna Loa volcano, Hawaii. Geology, 29: 163-166. Hitchcock C H, 1909. Hawaii and its Volcanoes. Honolulu: Hawaiian Gazette Pub Co, 306 p.
Jurado-Chichay Z, Rowland S K, 1995. Channel overflows of the Pohue Bay flow, Mauna Loa, Hawai'i: examples of the contrast between surface and interior lava. Bull Volcanol, 57: 117-126. Jurado-Chichay Z, Rowland S K, Walker G P L, 1996. The formation of circular littoral cones from tube-fed pahoehoe, Mauna Loa, Hawai'i. Bull Volcanol, 57: 471-482. Lipman P W, 1995. Declining growth of Mauna Loa during the last 10,000 years: rates of lava accumulation vs. gravitational subsidence. In: Rhodes J M, Lockwood J P (eds), Mauna Loa Revealed. Structure, Composition, History, and Hazards. Geophys Monogr, 92: 45-80. Lockwood J P, Lipman P W, 1987. Holocene eruptive history of Mauna Loa volcano. U S Geol Surv Prof Pap, 1350: 509-535. Macdonald G A, 1955. Hawaiian Islands. Catalog of Active Volcanoes of the World and Solfatara Fields, Rome: IAVCEI, 3: 1-37. Riker J M, Cashman K V, Kauahikaua J P, Montierth C M, 2009. The length of channelized lava flows: Insight from the 1859 eruption of Mauna Loa volcano, Hawaii. J. Volcanol. Geotherm. Res., 183: 139-156. Wanless V D, Garcia M O, Rhodes J M, Weis D, Norman M D, 2006. Shield-stage alkalic volcanism on Mauna Loa volcano, Hawaii. J. Volcanol. Geotherm. Res., 151: 141-155. Yokose H, Lipman P W, 2004. Emplacement mechanisms of the South Kona slide complex, Hawaii Island: sampling and observations by remotely operated vehicle Kaiko. Bull Volcanol, 66: 569-584. Zimbelman J R, Garry W B, Johnston A K, Williams S H, 2008. Emplacement of the 1907 Mauna Loa basalt flow as derived from precision topography and satellite imaging. J. Volcanol. Geotherm. Res., 177: 837-847. There is data available for 110 Holocene eruptive periods. 1750 (?) Unknown Confirmed 0 Historical Observations North flank (2380 m) and SW rift zone? Remarks: Two earthquakes triggered subsidence of lava deposits on Hawaii. ENVISAT ASAR mode 4, track 157, interferogram spanning 17 February?29 December 2006 and indicating deformation associated with the 15 October 2006 Hawai?i earthquakes. The lava flows discussed in the text are outlined and labeled. The dashed boxes delimit areas covered in Figures 4?6, and the gray box outlines the area of Figure 7. The fringes at the summit of Mauna Loa indicate long-term volcano inflation (confirmed by GPS measurements) and are not related to the 15 October 2006 earthquakes. The inset shows the location of the K?holo Bay (Mw 6:7) and Mahukona (Mw 6:0) earthquakes, with locations and focal mechanisms from the Global Centroid Moment Tensor catalog (see the Data and Resources section). Poland, M., 2010. Localized surface disruptions observed by InSAR during strong earthquakes in Java and Hawai'i. Bulletin of the Seismological Society of America, 100(2), 532-540. Remarks: InSAR shows inflation of a dike-like magma body in the southwest rift zone between 2002 and 2005. (A) Averaged 2002 to 2005 satellite radar interferogram of the Big Island of Hawaii showing ground velocity in the radar line-of-sight (LOS) direction. The radar looks toward the east (ascending orbit) with an incidence angle of ~45? on the ground (Standard Beam A6). The star denotes the 1983 Kaoiki earthquake. The seismicity with depth > 20 km and with M > 2.2 is also shown. (B) Vertical and east component of the ground-velocity field obtained by combining averaged interferograms from four different viewing geometries. The black line and circle indicate the dike and magma chamber, respectively, of the model in Fig. 2A. From: Amelung et al. 2007. Reference List: Amelung et al. 2007. Kilauea Iki crater in the foreground was the site of a major eruption in 1959. 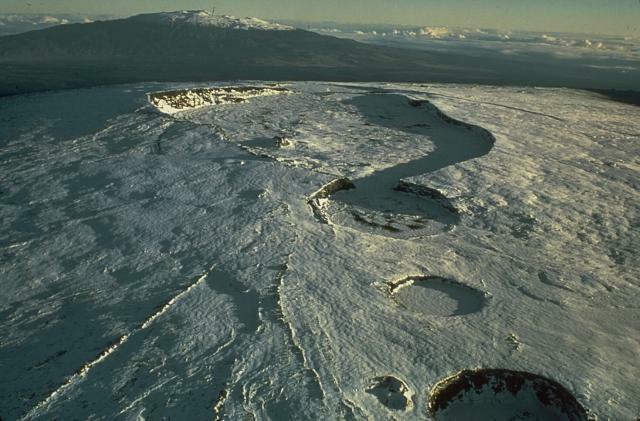 The 800 x 1500 m wide crater, seen here from the east with snow-capped Mauna Loa in the background, is located at the head of Kilauea's east rift zone. Steam rises from the floor of Kilauea caldera at the left. Photo by Richard Fiske, 1967 (Smithsonian Institution). A 3 x 5 km caldera occupies the summit of Kilauea volcano. Kilauea, the home of Madame Pele in Polynesian legend, has been Hawaii's most active volcano during historical time. Kilauea is a low shield volcano that is perched on the east flank of massive Mauna Loa volcano, whose snow-capped summit is seen in the distance. Eruptions at Kilauea predominately produce fissure-fed lava flows, but occasional large explosive eruptions have also occurred. Eruptions originate both from within the summit caldera and from SW and east rift zones that extend to the sea. 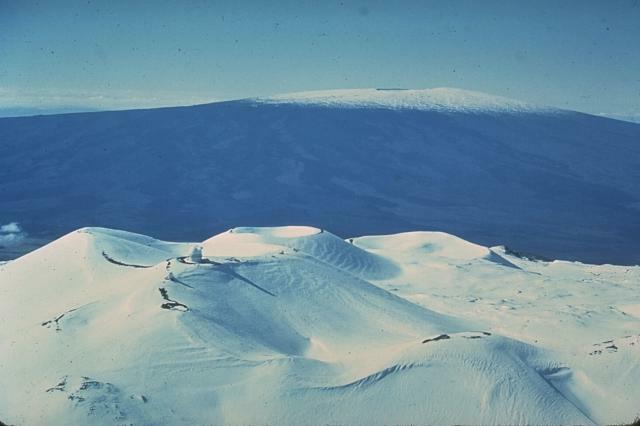 This 1975 photo of the snow-covered summit of 4170-m Mauna Loa volcano from the SW shows the 2.4 x 4.8 km wide Mokuaweoweo caldera in the center, with three circular pit craters in the foreground. South Pit (partially truncating the SW caldera rim), Lua Hohonu, and Hua Hou (foreground), formed by collapse along the upper SW rift zone. Mauna Kea shield volcano rises to a height of 4206 m in the distance. Photo by Don Peterson (U.S. Geological Survey). 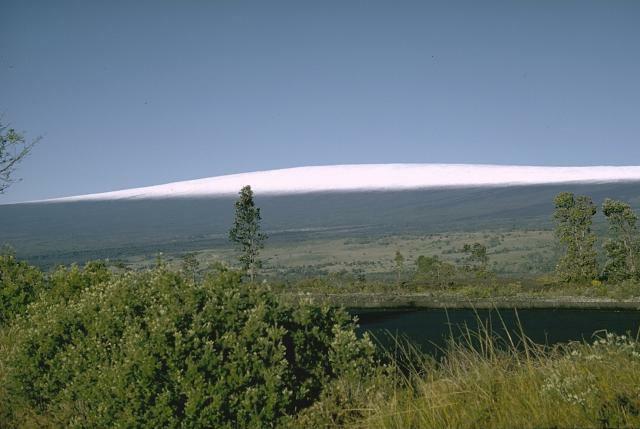 The low-angle slopes of snow-capped Mauna Loa shield volcano give a deceptive perception of the size of the world's largest active volcano. Mauna Loa rises nearly 9 km from the sea floor to an altitude of 4170 m. Mauna Loa's elongated profile was created by repeated eruptions of thin lava flows, primarily from fissure vents along NE- and SW-trending rift zones. Almost 90% of the volcano's surface area consists of lava flows less than 4000 years old. Photo by Richard Fiske (Smithsonian Institution). 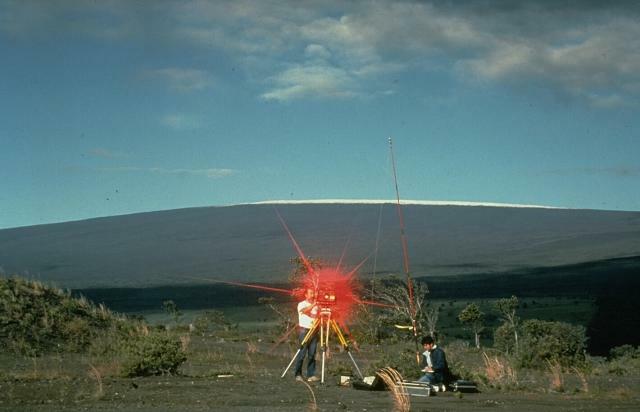 Hawaiian Volcano Observatory scientists conduct an electronic-distance measurement (EDM) survey on the rim of Kilauea caldera in 1988, with snow-capped Mauna Loa in the background. The procedure uses a laser beam, which is reflected back to the EDM instrument from a distant cluster of reflectors. A precise determination of the horizontal distance between the two points is made by a small computer in the EDM instrument. These measurements allow scientists to detect inflation of the volcano as magma rises to the surface prior to an eruption. Photo by J.D. Griggs, 1988 (U.S. Geological Survey). A line of lava fountains cutting across the floor of Mokauweoweo caldera is seen from the west caldera rim on April 9, 1940, two days after the start an eruption from the summit and upper SW flank. The fissure originated from a point NE of the center of the caldera and propagated a total distance of 6 km across the caldera and down the SW rift zone. During the course of the eruption, which lasted until August, lava flows covered 2/3 of the caldera floor. Photo by G.O. Fagerlund (U.S. Geological Survey). A lava fountain rises from a cinder cone in the summit caldera of Mauna Loa on April 12, 1940. 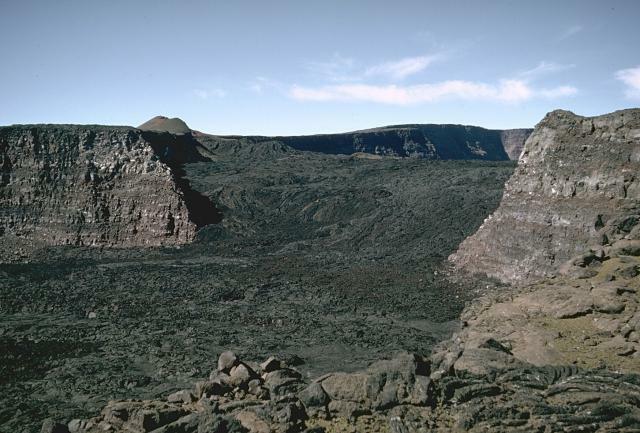 This view from the SW rim of Mokuaweoweo caldera shows the 1940 cone, which has remained the most prominent topographic feature within the caldera, and solidified lava flows in the foreground that originated from the cone. The eruption began within the caldera the night of April 7 from fissures which soon migrated down the SW rift zone. A 6-km-long fissure was active, and produced lava flows that covered 2/3 of the caldera floor. The eruption lasted until August 18. A billowing cloud of white steam rises from the west coast of island of Hawaii on June 2, 1950, at a point where a lava flow from Mauna Loa enters the sea. The incandescent flow at the right, the Kaapuna lava flow, was the last of three lobes that entered the sea on the second day of an eruption that originated high on the SW rift zone. The lava flow cut the road encircling the island near Heku Point and destroyed a new restaurant and several buildings. The eruption lasted until June 23. Photo by Gordon Macdonald (U.S. Geological Survey). 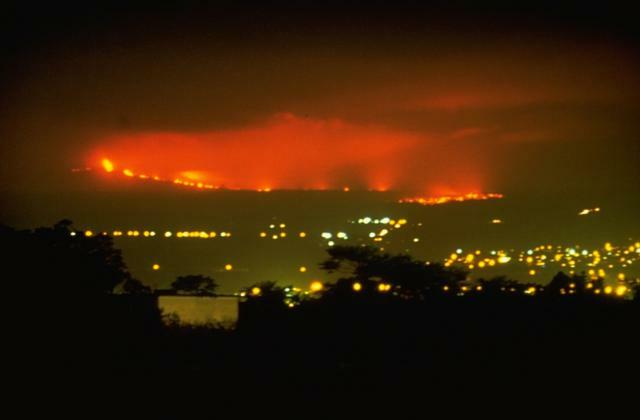 This nighttime view from the city of Hilo shows lava flows from Mauna Loa descending its NE flank. The flows traveled 42 km from vents on the upper NE rift zone of Mauna Loa, finally stopping only 5 km from the Hilo city limits. The 1984 lava flows were among the longest during historical time from Mauna Loa, matching the length of the 1942 flows. Only the 1855 and 1881 lava flows traveled significantly longer; the latter reached within 2 km of Hilo Bay. Photo by David Little, 1984 (U.S. Geological Survey). This spectacular aerial view from the south on March 5, 1984, shows lava fountains feeding a lava flow down the NE flank of Mauna Loa, with Mauna Kea volcano in the background silhouetted by the rising sun. The eruption originated at 0126 hrs from the summit and upper SW rift zone, but the eruptive fissure soon migrated across the summit caldera and down the NE rift zone. At the time of this photo a segment of the rift zone between 3700 and 3780 m altitude was active. Several hours later a new eruptive fissure opened 7 km farther to the east. Copyrighted photo by Katia and Maurice Krafft. The steep walls of Lua Poholo pit crater, immediately NE of Mokuaweoweo caldera, expose a small portion of the massive pile of thin, overlapping lava flows that have construced the Mauna Loa shield volcano. This view from the NE shows the rim of Mokuaweoweo caldera at the upper right. Lava flows from recent eruptions, including the last eruption of Mauna Loa, in 1984, fill the floor of the pit crater. Photo by Paul Kimberly, 1994 (Smithsonian Institution). 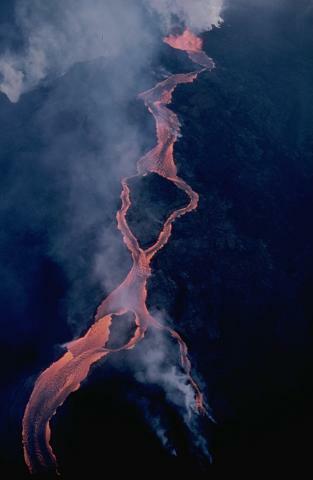 A lava flow from the NE rift zone of Mauna Loa travels down the east flank on March 30, 1984. The flow developed a braided morphology as it detoured around topographically higher areas. These flows originated from the easternmost vents of the 1984 fissure, which opened during the afternoon of March 5 at 2900 m altitude, just below Puu Ulaula, and remained the only active vent of the eruption until it ended on April 15. Photo by J.D. Griggs, 1984 (U.S. Geological Survey). 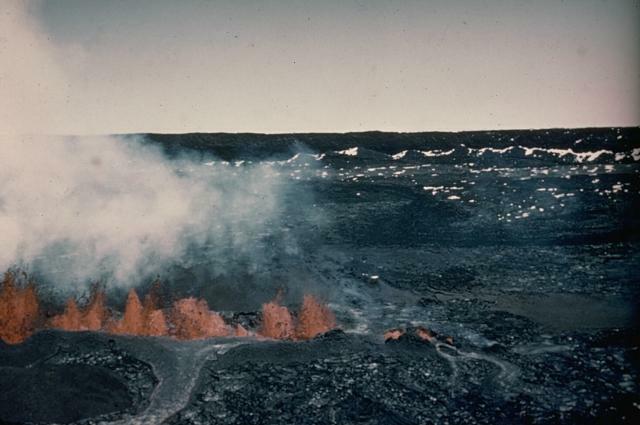 A cinder cone formed during an eruption of Mauna Loa in 1940 is seen in the center of Mokuaweoweo caldera in this 1966 view from the south rim of the caldera with the west caldera wall in the background. The eruption began along a 6-km-long fissure that cut across the caldera and down the SW rift zone. Activity soon became focused within the caldera, where fissure-fed lava flows covered 2/3 of the caldera floor. The 1940 cinder cone has remained the most prominent feature of the caldera floor. Photo by Richard Fiske, 1966 (Smithsonian Institution). 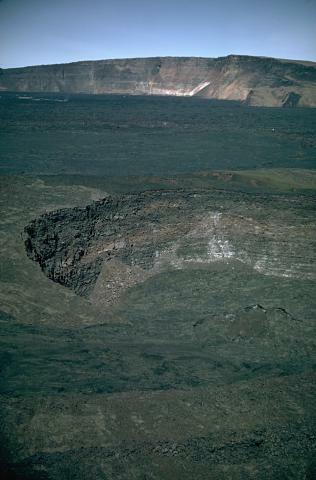 This 1966 view from the SW, on the east rim of South Pit, a pit crater that cuts the south rim of Mokuaweoweo caldera, shows lava flows from the 1949 eruption of Mauna Loa. 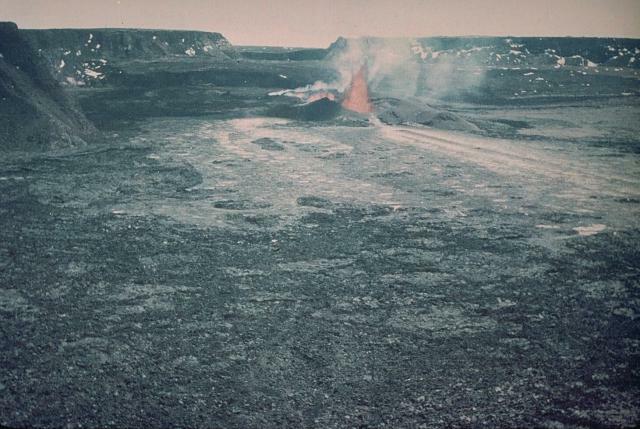 The 1949 eruption produced lava flows that covered the southern half of the caldera floor, poured through the breach into South Pit, covering its entire floor (foreground), and then spilled an additional 9 km down the south flank. The small cinder cone on the left skyline was constructed along the main eruptive fissure, which fed a lava flow that traveled 11 km down the west flank early during the eruption. 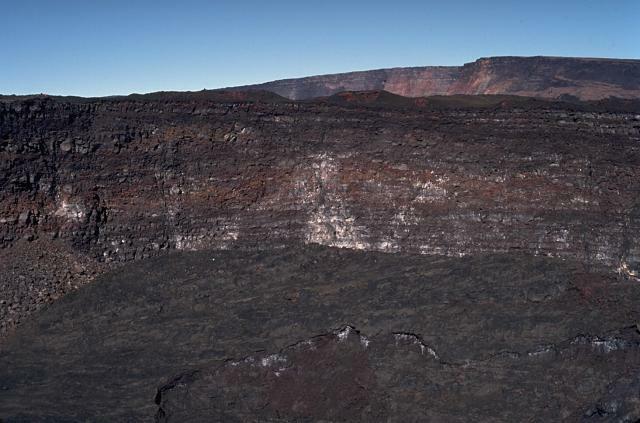 The steep walls of Lua Poholo pit crater in the foreground, immediately NE of Mokuaweoweo caldera, expose a small portion of the massive pile of thin, overlapping lava flows that have constructed the Mauna Loa shield volcano. 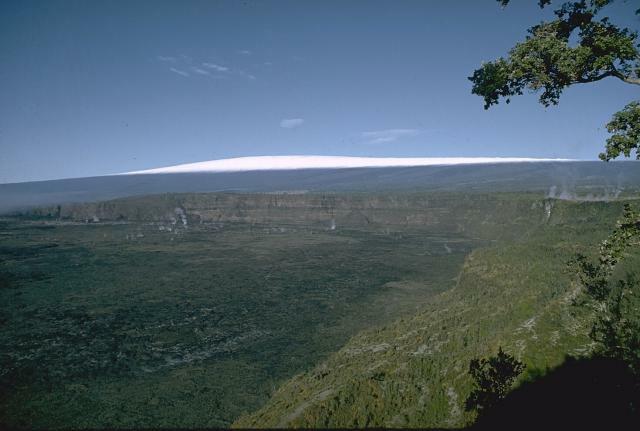 This 1987 view from the NE shows the west rim of Mokuaweoweo caldera, which forms Mauna Loa's summit. The vast field of fresh lava flows covering the floor of the caldera was erupted in 1984. Photo by Richard Fiske, 1987 (Smithsonian Institution). 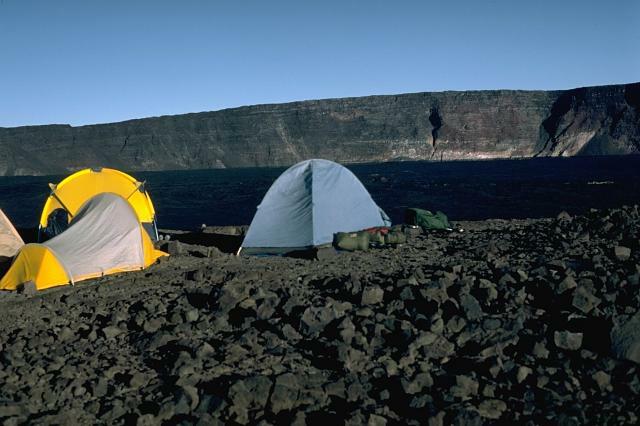 A campsite on the eastern rim of Mauna Loa's summit caldera looks across the floor of Mokuaweoweo caldera to the volcano's slightly higher west rim. 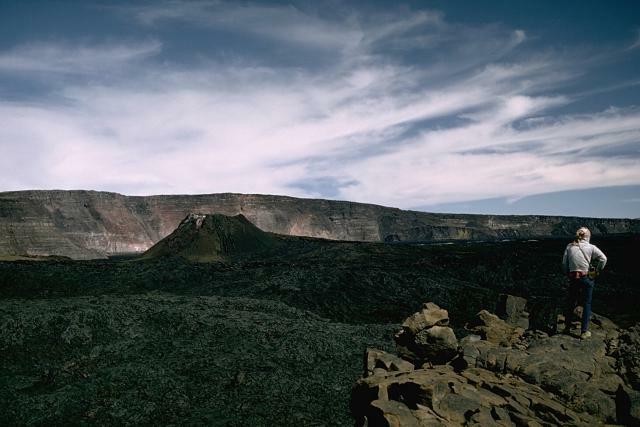 The west caldera wall rises about 180 m above the caldera floor. Dark-colored lava flows, most recently from the 1984 eruption, cover the caldera floor. Lava flows from the 1975 eruption also covered almost the entire floor. Incremental filling of the caldera has almost halved the maximum caldera depth of 320 m recorded during historical time. 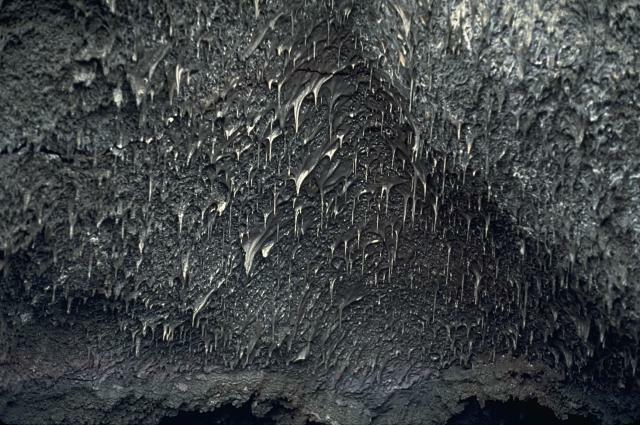 Lava stalactites are abundant on the ceiling of a 1984 eruptive vent along a fissure that cut across the Mokuaweoweo caldera of Mauna Loa. The 1984 fissure at this location on the SW rim of the caldera cut through the cinder cone of the 1949 eruption. Intense heat partially melted the vent walls; the dripping lava then solidified, forming the stalactites. Hawaii's two largest shield volcanoes, Mauna Loa (in the background to the south) and Mauna Kea, have dramatically differing profiles. Mauna Loa, the world's largest active volcano, has the classic low-angle profile of a shield volcano constructed by repetitive eruptions of thin, overlapping lava flows. Mauna Kea is also a shield volcano formed in the same manner, but its profile has been modified by late-stage explosive eruptions, which constructed a series of cinder cones that cap its summit. Photo by Don Swanson (U.S. Geological Survey). The symmetrical Goodrich cinder cone has a well-preserved crater. It is one of many late-stage cinder cones capping the summit of Mauna Kea, and is seen here from the the summit of Mauna Kea with Mauna Loa volcano to its NE. Dark-colored, unvegetated lava flows, many of historical age, descend the flanks of Mauna Loa. 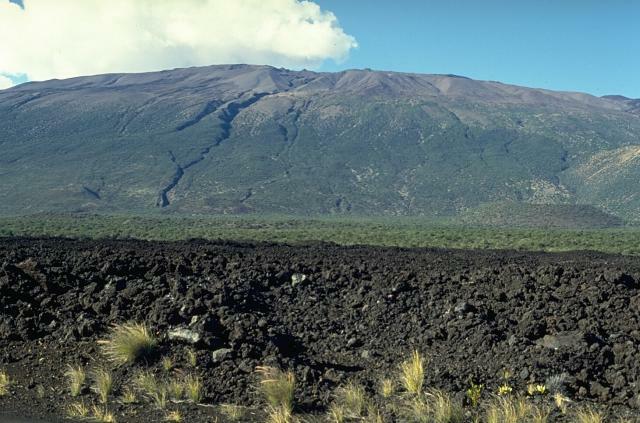 Virtually the entire Mauna Loa surface seen here consists of lava flows erupted during the past 4000 years. Mauna Kea (left) and Mauna Loa (right), both over 4000 m above sea level, are the world's largest active volcanoes, rising nearly 9 km above the sea floor around the island of Hawaii. This aerial view from the NW shows the contrasting morphologies of these two shield volcanoes. In contrast to the smooth profile of Mauna Loa, Mauna Kea's early shield volcano morphology is modified by the late-stage products of explosive eruptions. 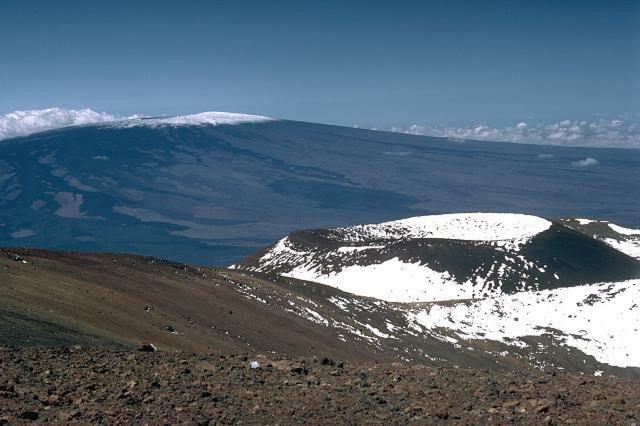 Mauna Kea, Hawaii's highest volcano, is seen here from the south at the broad Humuulu Saddle between Mauna Kea and Mauna Loa. The fresh lava flow in the foreground was emplaced during an 1843 eruption that originated on the NE rift zone of Mauna Loa. The flow traveled directly north to the Mauna Kea saddle, where it was deflected to the west. The irregular profile of the unvegetated summit region of Mauna Kea shield volcano is produced by a cap of cinder cones and pyroclastic ejecta that is not present at Mauna Loa. The following 331 samples associated with this volcano can be found in the Smithsonian's NMNH Department of Mineral Sciences collections, and may be availble for research (contact the Rock and Ore Collections Manager). Catalog number links will open a window with more information. Large Eruptions of Mauna Loa Information about large Quaternary eruptions (VEI >= 4) is cataloged in the Large Magnitude Explosive Volcanic Eruptions (LaMEVE) database of the Volcano Global Risk Identification and Analysis Project (VOGRIPA).